Target is at it again, bringing style to the masses with four new designer collections. There is definitely a retro modern vibe at work, especially with the Route 66 inspiration byThe Curiosity Shoppe. Seems everyone - from Free People and Urban Outfitters Rookie Road Trip blog to Albertson's Best Road Trip Ever contest - has jumped on the 'Road Trip' trend this summer. 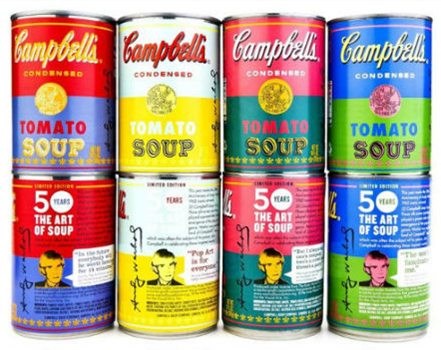 And my personal fav....the celebration of the 50th anniversary of Andy Warhol's Campbell's Soup can. Fifty years after the artist created one of the art world's most iconic images with his red and white painting of a tomato soup can, the company that inspired the work is selling limited-edition soup with designer labels. Campbell's Soup has launched a series of four canned tomato soups with labels that pay homage to Warhol's 1962 work of art '32 Campbell's Soup Cans'. Timed to coincide with the 50th anniversary of Warhol's first solo exhibition, about 1.2 million cans of the tomato soup will be sold in Target stores across the United States for 75 cents (S$0.90) each. The company's design team, working with The Andy Warhol Foundation for the Visual Arts, created four different labels in vibrant combinations such as pink and teal for the tomato soup that went on sale this month.